Each and every one of our harps is expertly hand-made in our music barn workshop. We use quality materials and techniques to ensure a beautiful looking and sounding instrument. Our workshop, located in beautiful Red Wing, Minnesota, was once the ground floor of an agricultural barn, complete with cattle. We restored and repurposed it, and today we call it the Stoney End Music Barn. Inside, you’ll be greeted by the scent of freshly-cut wood and find our talented staff working on a-dozen-or-so harps on any given day. Since we began in 1984, more than 7,000 harps have come out of the workshop and found happy owners. Each of our harps starts from the best Cherry, Walnut, or Maple. 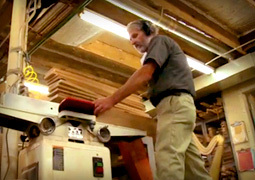 In the wood shop area, we begin with power saws and sanders to rough-cut wood pieces into pilars, harmonic curves, and sound boxes. 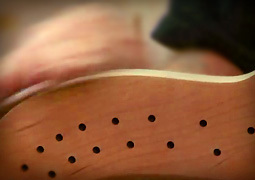 We then carefully shape and fit them with handtools. The refined pieces are glued and clamped firmly in place. Once the harp is assembled, it is moved to the finishing area where we apply a water-based lacquer to enhance and protect the instrument. Finally, we string the harps and install their levers. If you’re curious about how we make our harps, you can see for yourself. Guided tours of the workshop and grounds are a fun way to spend an afternoon and see what goes into a Stoney End harp. Group tours must be arranged in advance for a small fee. Gary joints Cherry wood pieces for harp bases. 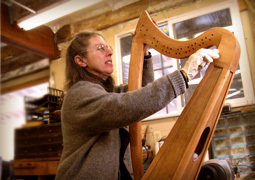 Cathy repairs a Cross-Strung Esabelle-22 harp.